Welcome! The Office of Contract Administration, operating under the direction of the Office of Financial Affairs, is responsible for the processing of all University contracts. 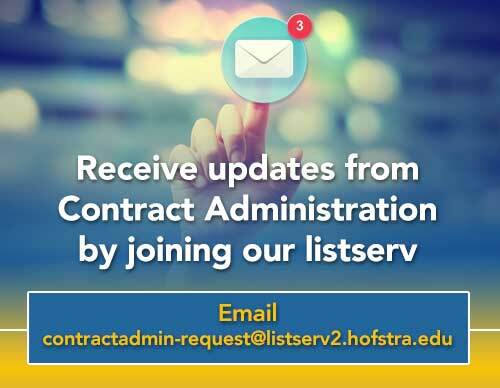 The Office provides a variety of services to guide departments through the contract review process and to ensure that contracts entered on behalf of the University comply with University policies, and applicable federal and state laws and regulations. The services provided include developing and maintaining standard contract forms, coordinating the legal, insurance and financial reviews, providing training and assistance in the resolution of contract disputes. Contract Administration is committed to working with all University departments to ensure the timely review and processing of all agreements. All University agreements must be signed by the President or Senior Vice President for Financial Affairs, or in rare cases, a designee authorized by the President. This website is provided as a resource for departments and includes convenient access to relevant forms and information. Should you have specific questions or comments, please contact the office.